The Caney Fork- Generation and the water levels on the Caney have been either way up or way down. The Army Corps is releasing 2 generators worth of Center Hill's water most days during the week. 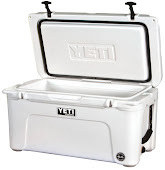 Sinking lines are the flavor of choice and white has been the color. Boat control and line speed have been the ticket to producing some good fish. There are not huge numbers but there is some quality fish coming to the net. It's been a while but the other day a train came rolling through the Crossover and we were in the right place at the right time. The train had passenger cars with some people aboard who seemed to be enjoying their time passing through the backwoods, off the beaten path. We enjoyed seeing the train pass along the bluff and then slow to turn the corner in the river, presumably so there would be no drinks spilled. The brook trout have made an appearance on the Caney again. They are out there and showing up in force. When angler's have found one they have found two, three and sometimes many more than that. These fish are small but entertaining. Most of the fish are in pretty good shape with decent color and as can be seen in the photo below, some will be nice when they grow into their tails. Low water nymphing and midge fishing have both been productive in most sections of the river. Sometimes angler's will go through a drought without action, however fish can be caught in most sections. On windy days it can be real tough to get a natural presentation, so seek out the calmest water with the best flow to get the desired results. The water in the lake has cleared up and the visibility in the river is nice right now. The only thing that has negatively affected the clear water is heavy rain. Muddy water from the creeks can stain the river on the edges. Browns have been lining up for ambush possibilities. Don't miss an opportunity to fish the seam of clear and stained water. There is a report from the Caney that hopefully gives anglers some information that can be useful. 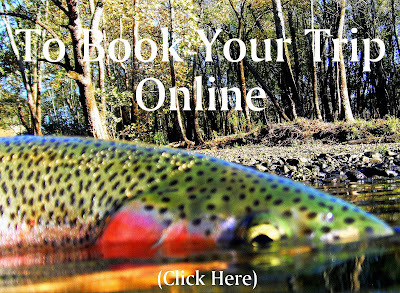 The float trip calendar is filling and the trips on the river, so far, this year have been good. Even with this crazy winter or should we say non-winter this has been a good year to be out there. 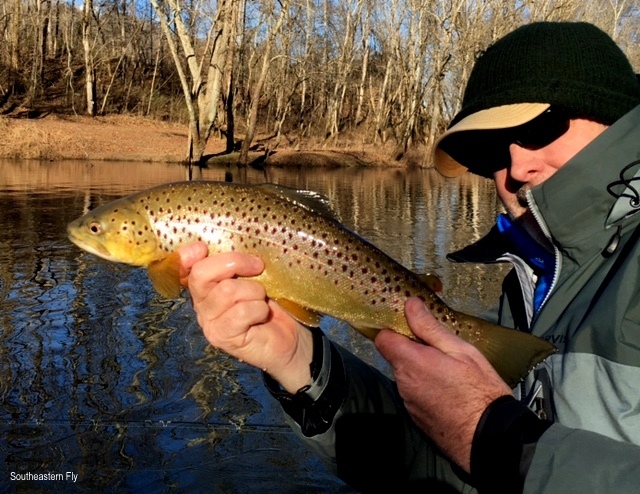 We returned from Louisiana and the red fish only to find the trout around the Middle Tennessee area having been waiting. The trips to river since the return have been good. The trout have decided they like our streamers and bugs. The trout have the anglers and the guide both very happy. The flows from Center Hill have been high during the week days. One and two generators throughout the day have been feeding the river with plenty of flow. These have been streamer days with some unorthodox methods that have been bringing fish to the net. These trips are not easy, but can be rewarding. When angler's get themselves in the front brace the old "bang the banks" type of fishing is the go-to. But, throughout the winter I've been working on some techniques that everyone is not using. Those techniques have been helping angler's get their "hero shots' and shots for this report. Frankly the right speed of retrieve is pretty much, well, everything. If throwing a streamer all day on the Caney isn't your cup of tea then the lower flows of the weekend days may be for you. These trips have been fun with a little bit of streamers and a little bit of nymphing. The trips have been productive and angler's have been experiencing some good catch rates. The browns are as colorful as I can remember and the pink/red stripe on the rainbows is vivid. The Elk River has been flowing 80 CFS on the weekends. 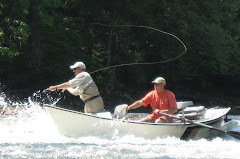 That flow is favorable to fishing for both wading and floating anglers. Streamers have been bringing a few fish to the net but the nymph still is producing the most fish and most times the nicest fish. We are hoping the institution of the 20" limit will help with growing some bigger browns on the Elk. The signage is not in the parking lot under Highway 50 it can be found in the upper parking lot. This will hopefully be a step in the right direction. Overall the trips to the river have been good. Angler's who have been in the casting braces have been pretty happy and that makes the guy on the oars pretty happy as well. It's been good to talk with anglers and be able to help some with their adventures on the rivers around Middle Tennessee. If you have questions and just need some direction or want to book a trip and get a date on the calendar, as always feel free to email, text or call. I think the photo above and Mark's smile say it all, at least it explains how good the fishing portion was on this trip. If you have been following Southeastern Fly on Facebook and/or Instagram you already know we spent the best part of the last several days in Louisiana. The food, the accommodations and the fishing were all very good. The adventure, well it was outstanding. The night we arrived a phone call came from our host guide Cleve and he said we were going to make the trip to the Chandeleur Islands. The boat ride (race) would be about an hour on open water in a 20'ish foot skiff. Once there, we would hope the fishing would be good. Everyone who knows me understands that if there is a chance for adventure, let's just say I'm all for it. The Chandeleur Islands have long been on my bucket list. Every since my grandfather and uncle went out there on a mother ship and reported how enjoyable it was to be there, I have wanted to go. They fished for several days, while eating good food and taking-in the small strip of sand which is only slightly wider than an interstate in some places.. The stories of fishing for sharks, redfish and trout as well as the rest of their adventure have haunted me since. So Cleve was getting it right and we had not even left the dock. When our two skiffs, two guides and four anglers left the dock we motored out past the no wake zone and got on plane, then we spotted a coyote that for some reason decided it needed to cross the canal. The wildlife was out and on the move. After a couple quick photos we were back on plane for an all out run to that small strip of sand. After a break at the halfway mark we were underway again. The dolphins and ducks, so many ducks were on the move too. Then the small strip of sand came into view and a short time later we had arrived. We began with some instruction of do's, dont's, including the finer points of a successful day. It wasn't long before we were in the front brace with a redfish on the end of the fly rod. There were a lot of firsts on this trip and everyone got their first bull red. The rest of our day was spent chasing big reds with fly rods, eating huge sandwiches and messing about in boats. It was long day of fishing and catching. Then we were making the trip back across open water and into the marsh, then finally back at the dock. Before long we were in the car and on the ferry for our last leg of the day. We wrapped up the day with a buffet at the lodge, while sharing our views of this most enjoyable day. Early to rise and a nice breakfast at the lodge. Lunch was ready and we were off to enjoy day two. The weather on this day two was even better than the first day as a front was approaching. The fish would have their own plan but we would make the most of it. We pulled onto the ferry and our adventure continued. Finally to the dock where the skiffs waited. Once again we were motoring slowly out of the no wake zone. We raced along the canals, through larger ponds and into openings. The skiff stayed on plane for quite a while. Then we pulled up to a bank that looked just like every other bank. Cleve had an idea that the fish might be here on this higher tide. So with Cleve on the poling platform and an occupied casting brace we went to work. A few strips in this position and a red bumped the fly. On the next strip the fish ate. A quick strip-set and the fight was on. The fish made several runs and then came to the boat. We would pulled three fish out of this small hole that was no bigger than the skiff from which we fished. And this hole looked just like any number of other holes along the marsh. This spot was special and we fished it until the light was just too low for effective fishing. The mosquitoes were absolutely the worst I have ever seen. Worse than the backwaters of the Mississippi River, worse than the backwaters of Apalachicola Bay, worse than, well you get the picture. In this marsh they would cover every surface and could eat their way through four layers of clothing if provoked. The low light and high mosquito count finished our day. We reeled up the line and soon we were on plane again for that long ride back to the dock. We raced through the canals and finally the skiff decelerated into the no wake zone. Our sister skiff and its occupants waited at the dock. The boats were trailered and we all said our goodbyes. Soon we were on the road back to the lodge. The distance was 45 miles and included an hour of driving as well as a ferry ride. We arrived for the final dinner on this trip. We would be the last group to dinner, but when we walked in there were some freshly shucked oysters waiting. Then the five courses began coming to the table. We ended the evening with a review of each angler's day. Then it was time to get back to the rooms and prepare for the ride home. The ride back to Tennessee provided plenty of time to plan the next adventure. 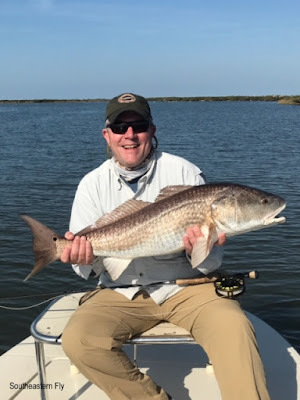 It looks like there will be another trip back to the redfish grounds. This trip was an excellent way to see what might work for a larger party with more anglers, more skiffs and of course more food. Stay tuned as future trip details are worked out. Thanks for stopping by to read the fishing report. Right now the report is still all about high water. With that said I am joining a group of friends and anglers for a few nights at Woodland for some R&R. And a trip wouldn't be complete without doing our best to get a fish on the end of line. For the most up to date reports on this trip and tailwater trips there are a few different ways to keep up with the action. If you have Facebook you can follow us at Southeastern Fly., on Twitter @southeasternfly and on Instagram @southeasternfly. Instagram is quickly becoming my favorite and probably gets the most updates. Tailwater streamer trips are getting on the calendar and the "Will Call" is still working for getting anglers on the water at good times. If you have a question about conditions on the the Middle Tennessee tailwaters or want to book a trip just give us a call, text or email. Now off to the next adventure.